MADRID: Barcelona scored their 6,000th goal in La Liga after another ingenious strike by Lionel Messi got their title defence off to a winning start. 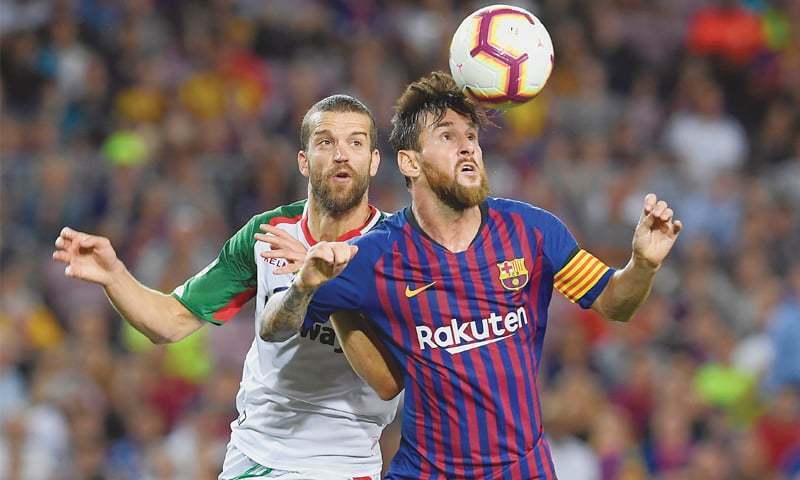 Messi cleverly sent his free-kick underneath the Deportivo Alaves wall to open the scoring in the 64th minute of Barcelona’s 3-0 win at the Camp Nou Stadium on Saturday. Messi’s low free-kick fooled Alaves’ players, who jumped to intercept an expected high shot. Goalkeeper Fernando Pacheco couldn’t get to the ball in time after it suddenly appeared underneath the barrier. Messi, the league’s top scorer last season, had struck the crossbar with a free-kick this time over the wall in the first half. He also hit the post from inside the area a few minutes after his opening goal. Messi also scored Barcelona’s 5,000th league goal back in 2009, and the Argentine provided 338 of the goals taking the total from 5,000 to 6,000. Barcelona’s first-ever league goal was scored by Manuel Parera against Racing Santander on Feb. 12, 1929. Barcelona opened their league campaign with a win for the 10th straight season. Barcelona had missed chance after chance in their league debut at Camp Nou, which was far from packed with around 52,000 fans for the 10:15pm start local time. Earlier on Saturday, Real Sociedad capitalised on two defensive errors to come from behind and win 2-1 at Villarreal, who saw Santi Cazorla make his first competitive appearance since October 2016 after recovering from a serious foot injury. Celta Vigo were held to a 1-1 draw by Espanyol, while on Friday Levante pulled off a surprise 3-0 win at Real Betis.